As I retired medical doctor, I still have a serious interest in the research on the relationship between alcoholic drinks and a healthy lifestyle. Humans have been consuming wine for over 10,000 years and the link between wine and health has been recognized for over 5,000 years. It is clear from the writings of the ancients that they knew that there was a boundary between the health benefits of wine and hazardous imbibing. The term, hormesis, applies here, meaning a biological phenomenon in which the favorable effect of moderate dosage of a substance is toxic in higher doses. Readers will find this review helpful in keeping them informed about important scientific publications and policy statements. However, it cannot be emphasized enough that they should follow the lifestyle, diet and drinking advice of their doctors. A number of issues related to alcoholic drinks and health were prominent in the news and scientific press in 2013. The escalation of drinking in women received the most publicity along with continued controversial studies and recommendations regarding drinking during pregnancy and the relationship of drinking to breast cancer. The ongoing debate over the relative advantages of drinking wine versus beer received notice as did the tendency of the public to incorrectly understand the idea of a standard drink, frequently believing a standard drink is of greater volume than it is. There were a number of new alcohol related laws and taxes proposed both in the United States and abroad, and wine labeling issues continued to occupy the public’s interest. Some alarming studies on binge drinking in young people and the resulting adverse health consequences, should bring all parents and advisers to attention. Studies of polyphenols, particularly resrveratrol, continue to show health benefits, perhaps a role in increased longevity, and some value in preventing and or treating cancer, although the results continue to require a cautious interpretation. Finally, there were some major research studies reported on the relationship of moderate alcohol consumption and health and lifestyle. No new policy recommendations were issued by the United States government in 2013. The most recent revised National Institutes of Health 2010 Dietary Guidelines for Americans (www.health.gov/dietaryguidelines/) include information on the benefits of moderate drinking, but they do not advise abstainers to begin drinking for health reasons. The Dietary Guidelines are being reviewed in 2014 and the 8th edition of The Dietary Guidelines will be published in the fall of 2015. In the following pages, I will summarize peer-reviewed, scientific studies published in 2013 that contribute to our understanding of the roles that alcohol, and in particular wine, play in our health. Papers presented at conferences are also included. This year I have chosen to be more concise since I realize most readers of this publication are not interested in an extensive discussion and critique of each scientific article. For those wishing to seek out the articles in their entirety, visit PubMed which comprises more than 21 million citations for the biomedical literature from MEDLINE, life science journals and online books: www.pubmed.gov. In the capsular summaries of research, I have referred to “The Forum” a number of times for consensus opinion on the validity of some study’s conclusions. The Forum is the International Scientific Forum on Alcohol Research, a joint undertaking of the Institute on Lifestyle & Health of Boston University School of Medicine and Alcohol in Moderation (AIM) of the United Kingdom. The Forum includes a voluntary group of epidemiologists, statisticians, basic scientists, physicians, psychologists and specialists in social matters, psychology and public health. As a prelude to considering any study on the relationship between alcoholic drinks and health, it is important to understand the definition of “moderate drinking” since it is frequently referenced in research articles and is the level of drinking associated with health benefits in men and women. A few key definitions must be clearly understood. In the United States, a standard drink or unit contains 17.7 ml of ethanol (about 14 grams of pure alcohol) which is equivalent to 12 ounces of beer (about 5% alcohol), 5 ounces of table wine (about 12% alcohol) and a shot or 1.5 ounces of 80 proof distilled spirits (about 40% alcohol). A full bottle of wine (750 ml) contains about 5 to 7 standard drinks depending on the wine’s alcohol percentage. To determine the number of standard drinks in a bottle of wine, multiple 750 ml by the alcohol percentage and divide by 17.7. The 2010 Dietary Guidelines for Americans (DGA) state that if alcohol is consumed, it should be consumed in moderation which is defined as no more than 1 standard drink per day for women and no more than 2 standard drinks per day for men. This definition refers to the amount consumed on any single day and is not intended to be an average over several days. The National Institute of Alcohol Abuse and Alcoholism states that men should not exceed 4 drinks per day or a total of 14 per week and women should not exceed 3 drinks a day or a total of 7 per week. The American Heart Association recommends that men not exceed 2 units a day and women should not exceed 1 unit a day. When drinking wine, one must take into account the alcohol percentage, scaling back the volume of drinking when imbibing a wine with a higher alcohol by volume or reaching for a lower alcohol wine to insure that you stay within the confines of drinking moderately. 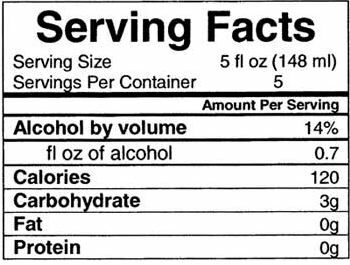 Remember also, that wines that are under 14.0% can be mislabeled by up to 1.5%, and wines that exceed 14.0% in alcohol can vary by 1% (a wine that says 14.1% on the label can actually contain 15.1% alcohol by volume). Drinkers commonly underestimate the amount of alcohol they imbibe, thinking a standard drink is of greater volume that it is. This is termed the “over-sizing effect” and leads to a false sense of drinking within the confines of moderation. Over-imbibing can be unintentional because of the various shapes of wine glasses, with wide glasses typically receiving inordinately larger pours. A study of wine-drinking subjects published in 2013 in Substance Use & Misuse from Iowa State University found (1) the average pour into a wide glass was 11.9 percent higher than into a standard glass; (2) 12.2 percent more wine was poured when a glass was held versus a glass placed on a table; (3) white wine pours were 9.2 percent more generous than red. 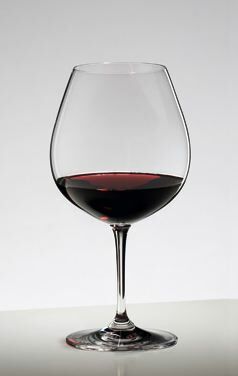 A Riedel Vinum Burgundy glass that is half-filled, holds a surprising 12 ounces. The photo below shows a Vinuum XL glass containing about 6 ounces, or close to one standard drink. A Health Survey for England conducted by the University College London and published in the European Journal of Public Health found that as many as three quarters of the people in the UK underestimate the amount they drink by up to 40 percent. Although four in five considered themselves a “moderate drinker,” they admitted to frequently exceeding the safe guidelines, but had no intention of scaling back. The study was based on the difference between self-reported alcohol consumption and alcohol sales. After the research was published, visits to Drinkaware’s website at www.drinkaware.co.uk/ surged to a five-year high and those who searched on the website for “how many units in a bottle of wine” rose 467%. Data taken from the National Health and Nutrition Examination Survey, 2009-2010, were analyzed and reported in the Journal of the Academy of Nutrition and Dietetics published online. On any given day, 36% of men and 21% of women consumed alcohol in the United States. 18 percent of men and 11 percent of women drink more alcohol than federal guidelines recommend and 8 percent of men and 3 percent of women are “heavy drinkers.” The percentages who drank more than the the government’s recommended limits were highest among men age 31 to 50 years and women age 51 to 70 years. The Survey concluded that the great majority of Americans stay within daily alcohol guidelines. A study released in 2013 from the Centers for Disease Control and Prevention found that excessive alcohol consumption costs the United States $223.5 billion a year. The study came from data in 2006. The costs were largely due to losses in workplace productivity, criminal justice expenses, motor vehicle crash costs, property damage, and higher healthcare demands. Binge drinking (five or more drinks on an occasion for men or four or more drinks on an occasion for women) was responsible for more than 70% of excessive alcohol use related costs. Wine writer Katie Kelly Bell wrote an article in Forbes, September 3, 2013, titled, “Are You Drinking Too Much? The Myth of Moderation.” I love her quote, “Today, it’s easier to solve a trigonometry problem in your head than to get a straight answer about how much we should be drinking each day.” I say, don’t obsess with the question of moderation. For maximum health benefits, have a modest glass or two of wine several days of the week with dinner, and avoid splurges. One approach that encourages moderation are lower alcohol or “lifestyle” wines which continue to be in the international news but have not taken off in this country. New Zealand is looking to be the world’s leading producer of lower calorie and lower alcohol wines. The producers there are trying to distinguish themselves by offering premium wines naturally produced using sustainable viticulture and native yeasts. Some of New Zealand’s largest wineries have signed up for the program including Giesen Wines, Mud House Wine Group, Pernod Ricard NZ, Spy Valley Wines, Villa Maria Estate, and Yealands Estate Wines.